By the time Labor Day rolls around, Marcie suspects this "vacation" has become permanent. She starts at a new school where a cute boy brings her breakfast and a new romance heats up. But understanding love, especially when you've watched your parents' affections end, is elusive. What does it feel like, really? Can you even know it until you've lost it? 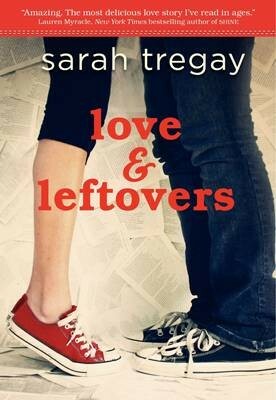 One winner with a US mailing address will win a signed copy of Love and Leftovers + a bookmark and necklace with guitar pick and charm! I've never read a novel in verse. It's not because I don't like them, I can never find on that interests me. Maybe I'll like this one. I don't like verse books, but I read Glimpse by Carol Lynch Williams. It really got my attention and I still find myself thinking about it all the time. I've never read a novel in verse, because i've never came across one. I would love to read one though! I love poetry of all kinds, so a whole book would be amazing! I don't think I've read a novel in verse. Just haven't gotten around to it yet. just starting off dont think i ever read one , havent gotten a chance to but is looking forward to reading one ! I don't know the last thing I read? I love to read Shakespeare though! My favorite novel written in verse is Chasing Brooklyn by Lisa Schroder. It was so beautiful to read, and the ghost story is haunting.